The back of the document reads in Russian and French: “На Николаевском вокзале” – “A la gare Nicolas” – [“At the Nikolaevskii Railway station”]. Black and white photograph; 11 x 15.5 cm. 1Grigorii Zinoviev was the first Chairman of the Executive Committee of the Comintern, from its inception in 1919 until he was driven from power at the end of 1926, although he continued to participate in Comintern activities at least until 1928. He was also Boris Souvarine’s nemesis, to whom Souvarine attributed responsibility for his exclusion from the Comintern secretariat. 2In those early days Zinoviev controlled the Comintern. According to Victor Serge, the Executive Committee of the Comintern existed in name only, “Zinoviev attended to everything,” sometimes consulting Lenin, more often Nikolai Bukharin and Karl Radek. One can understand Souvarine’s complaint that the dictatorship of the proletariat had been replaced by the dictatorship of the secretariat. Souvarine’s quip applied equally well to Zinoviev’s control over the Comintern as to Stalin’s takeover of the Bolshevik Party after Lenin’s death in 1924. Even in Victor Serge’s account written from the anti-communist perspective that was to be Souvarine’s, the latter is described as “biting, imperious, unruly, perpetually asking embarrassing questions.” No wonder Zinoviev was keen to get rid of him. 3Here Zinoviev is potrayed in this photo, at an unknown date, at the Nikolaevskii Station in Petrograd. He is surrounded by tough looking military men, soldiers and a sailor, one of whom is looking suspiciously into the camera. These men probably constituted Zinoviev’s bodyguard, essential companions at a time when memory was still fresh of the assassination of other Bolsheviks in Petrograd, such as Moisei Uritsky and the attempt on Lenin’s life at the same time. It was also a time of hunger when someone could be mugged in the street for a loaf of bread. The portly Zinoviev had every reason to be cautious and surround himself with a protective guard. 4The Nikolaevskii station had been built in 1844 as the terminal for the Moscow-Petersburg railway line. It was renamed Oktiabrskaya Station in 1924 and Leningradskaya Station in 1935. It is now known as the Moscow Railway Terminal. The freight station where goods were transferred from ships to railway travel inland lies behind the passenger terminal and is not visible here. Victor Serge, From Lenin to Stalin, New York: Monad Press, 1973. Richard Wohl, French Communism in the Making 1914–1924, Stanford: Stanford University Press, 1966. LIEBICH, Andre. 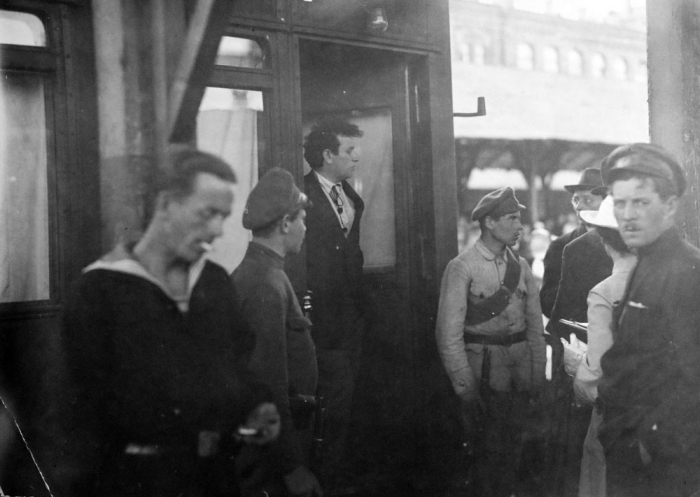 Zinoviev at Nikolaevskii Train Station, Petrograd [1921-1924?] 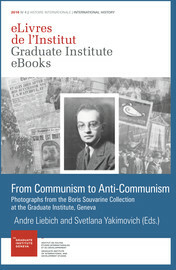 In : From Communism to Anti-Communism : Photographs from the Boris Souvarine Collection at the Graduate Institute, Geneva [en ligne]. Geneva : Graduate Institute Publications, 2016 (généré le 18 avril 2019). Disponible sur Internet : <http://books.openedition.org/iheid/6619>. ISBN : 9782940503971. DOI : 10.4000/books.iheid.6619. Liebich, Andre. “Zinoviev at Nikolaevskii Train Station, Petrograd [1921-1924?] ”. Liebich, Andre, et Svetlana Yakimovich. From Communism to Anti-Communism : Photographs from the Boris Souvarine Collection at the Graduate Institute, Geneva. Geneva : Graduate Institute Publications, 2016. Web. <http://books.openedition.org/iheid/6619>.